Having been bitten by the travel bug from a young age, I am always at my happiest when planning my next trip, or helping someone else tick a new destination off their travel bucket list! Destinations I love: New Zealand, Bali and California. Properties I love: St Regis Bora Bora in French Polynesia, Eagles Nest, Bay of Islands in New Zealand and COMO Shambala Estate in Bali. Recently visited: Costa Rica, Tanzania, Morocco, Italy, Ibiza, Estonia and French Polynesia. My tip: Pack light – both your luggage and your itinerary! Take time to carefully plan your trip to make sure you can include your highlights, whilst allowing plenty of time for relaxation and enjoying those local discoveries you weren’t expecting. Learning a few key phrases is always a good idea too - a friendly ‘hello’ goes a long way, whatever the language! Travelling has always been a part of my life. As a child we moved every four years due to my father’s job in the Foreign Office, I was fortunate to live in eight different counties by the time I started university. When my time came to find a job, the travel industry seemed like the perfect choice. I have not looked back since. Destinations I love: Vietnam, Mexico, Brazil, France and Italy. Properties I love: Castiglion del Bosco, The Greenwich, Belmond Grand Hotel Timeo and Punta dos Ganchos. I am a huge fan of sailing and yachting holidays. Recently visited: France, Italy, Greece, Morocco, Dubai, New York and Brazil. My tip: Try not to over-plan a holiday and leave some time to sit back and soak up a place. There is nothing I love more than sitting in a café watching the world go by. This is how you get to know a destination. I was born in Portugal and lived in Zimbabwe and Dominican Republic during my childhood which kickstarted a desire to travel. I love to arrange bespoke luxury travel, ensuring every experience is precisely designed to each client. My priority is always to listen to guest’s individual preferences, creating a completely tailored and unique trip. Destinations I love: Galapagos Islands, Argentina, South Africa and Kenya. Properties I love: La Residence, Jumby Bay, Eolo, Hotel Santa Caterina and Finca Cortesin. Recently visited: Argentina, Peru, Morocco, Antigua, Norway, Italy, Canary Islands and the USA. My tip: Getting an experienced guide in a new city is essential. They provide all the local insight from the area’s history to gastronomic hotspots, as well as helping you to feel orientated before your own explorations. From an early age I have loved everything about travel, so a career in the travel industry was always an obvious choice. I have worked in the luxury travel sector now for over 12 years and I’m still so passionate about sharing my knowledge and creating the perfect holidays for my clients. I’ve visited some amazing destinations over the years and have had some unforgettable experiences whilst living and working in three different countries. Destinations I love: Barbados, British Virgin Islands, Vietnam, Mallorca. Properties I love: Moonreach, Necker Island and Sa Terra Rotja. My tip: Explore as much as possible to absorb the local culture and eat out to enjoy some fantastic food! It’s also nice to learn a bit of the local lingo before you go as locals often appreciate a hello or thank you in their native language! I have always had a passion for travel and exploring new places. I have been lucky enough to travel to 50 countries and work on five continents, and I love nothing more than sharing my knowledge and enthusiasm with our clients. Before joining Oxford Private Travel I spent seven years in Africa working in luxury experiential tourism at some of the top properties on the continent, so I know what it takes to deliver a truly world class travel experience! Destinations I love: Seychelles, Croatia, Vietnam, India and Kenya. Properties I love: The Brando in French Polynesia, Londolozi Game Reserve in South Africa and Palazzo Avino in Amalfi Coast. My tip: Travel is all about experiences and memories. Whilst it’s important to take photos, make sure you also spend time soaking up the sights, sounds, smells and tastes of your destination too! After completing two ski seasons in Verbier, I felt it was time to get a 'proper job' in the ski industry. I love talking about amazing properties every day and count myself very lucky to have visited and experienced some of the best chalets in the Alps. I am a skier but can also snowboard. Favourite resorts: Zermatt, Verbier and Meribel. Ski seasons: Two in Verbier. Favourite properties: Chalet Norte in Verbier, Chalet Le Blanchot in Courchevel 1850 and Tivoli Lodge in Davos. Favourite lunch and après: Chez Vrony in Zermatt for a fine lunch and the aptly named Après-Ski Bar in Verbier. My tip: Avoid the morning queues at Medran in Verbier by asking your driver to drop you at Carrefour and use the six man chair to get up to Ruinettes. My love of travel was born in the mountains. At the age of 19 I chose to escape my stressful chef’s career in London and move to the Swiss Alps. From here my passion for skiing, the mountains and the travel industry grew; hence I chose to forge a career in this industry. For me travel and food go hand in hand. I’m the one you need to befriend for that elusive restaurant reservation. Destinations I love: New York City and the Alps. Properties I love: Park Hyatt in New York, Delano in Miami and W Verbier. Recently visited: Dubai, Miami, New York, Verbier, Courchevel and Orlando. My tip: Never waste money on bad food. When travelling to a destination speak to the locals and your pre-arrival concierge to find where to make a reservation. Never go for a stroll and hope to get lucky! In fairness I never thought my life would take me to so many wonderful places. Starting The Oxford Ski Company in 1998 was more a love of the mountains and working in the service industry than the skiing aspect. With Oxford Private Travel even more doors have been opened to visit new places. It never ceases to impress me how standards of travel, destinations and experiences across the world continue to evolve and improve. Destinations I love: The Alps, Greek Islands and Mexico. Properties I love: North Island in Seychelles and Le K2 in Courchevel 1850 (French Alps). Use an experienced Agent (of course). It is a false economy trying to do it alone. "Buy cheap, buy twice". My love of travel started like so many lucky graduates…a backpack, a rough guide and a Round the World ticket. From my early days of solo travel with a thirst to explore the unknown, a summer season working in Positano on the breathtaking Amalfi Coast, tailor-making bespoke holidays for an independent travel company, to marketing a fabulous collection of Caribbean, Indian Ocean and Arabian hotels. Destinations I love: Italy, Saint Lucia and San Francisco. Properties I love: Jade Mountain, Carlisle Bay and The Fairmont Royal Pavilion. Recently visited: Barbados, Mexico, Mallorca and Antigua. My tip: Always pack your swimwear in your hand luggage. If God forbid your luggage didn’t arrive when you do, you can always go for that all important first holiday swim! I love travelling, whether it is a beautiful paradise in the Maldives or the perfect luxury ski holiday in Val d’Isere. I love to visit new places and do my best to not visit the same city twice. There’s not much better than enjoying your time off with some fantastic activities alongside some fantastic food! Though I’m a young traveller at the moment I am looking forward to ticking of some fantastic locations in the future. Destinations I love: USA and Italy. My tip: Always make the most out of your travels and try to visit as much of the world as possible. Open yourself to new adventures, foods and more! With a background in marketing, my love for travel was only triggered in recent years. Since then, I have vowed to visit and experience as many destinations as possible – picking a completely new country each time I book a holiday. The incredible food and photography opportunities are two of my favourite reasons to travel, alongside meeting locals and learning about their varied culture. Destinations I love: Meribel, Amalfi Coast and Vietnam. Favourite properties: Chalet Le Grenier, Hotel Santa Caterina and Six Senses Con Dao. My tip: Plan in advance to ensure you cover all the sights and experiences important to you during your trip. That said, allow some flexibility in your itinerary for impromptu changes in resort to allow you to explore sights you’ve newly discovered throughout your trip. Exploring different countries and cultures by going on that perfect holiday is what motivates me and I’ve been very lucky to have been able to do a lot of overseas travel. I love spending quality time with family and friends, exploring new destinations and local food/wine. Favourite Destinations: Italy, Spain, Greek islands, Hawaii and the Caribbean. My Tip: Always take the time to plan your holiday and have an itinerary to ensure that you visit all the places you want to whilst in that country. Make sure you factor in some “down time” to relax and re-charge your batteries as well as sightseeing. The world is a small place these days with air travel so take time to go and explore different places. Good food and travel are two things which have always been close to my heart. Having lived for two years in France, travelled to many countries and having skied in various resorts across Europe for over 20 years – I feel extremely lucky to be able to help to facilitate others to enjoy similar experiences. Favourite resorts: Val Thorens, Courchevel 1850 and Saas Fee. Favourite properties: Hotel Le Val Thorens in Val Thorens, Hotel Le K2 Altitude in Courchevel and Chalet Annapurna in Saas Fee. My tip: Make the most of everything the mountains have to offer: Rise for first lift, eat lunch in one of the amazing mountain eateries and don’t forget to stop and take a moment to really appreciate the natural beauty – it really takes my breath away. Finally, relax in the afternoon sun with an après-ski drink and enjoy the delicacies of the local restaurants in the evening. I lived in Cyprus from the age of four so travelling, flying and seeing different cultures has been the norm for me from an early age. I love visiting new countries and particularly enjoy seeing how different cultures live and eat. I am a beginner skier. Destinations I love: Cyprus, St. Lucia and Italy. Properties I love: Anassa in Cyprus, Canella at Ca’nova in Venice and Jade Mountain in St Lucia. Recently visited: Cyprus, St. Lucia, Barbados and Costa Rica. My tips: Experience different tastes, sounds and cultures. Have a go at traditional dancing, try a dish you’ve never tried and meet people you will never forget because holidays are to be remembered. After working in Finance for the first three years of my career I had a desire to see more of the world. This led me to go and work as cabin crew for BA and Virgin Atlantic for a short time before returning to the world of Finance. I have now been lucky enough to combine the two by joining the Oxford Travel Collection. Now, holidays are a top priority in my family life! Destinations I love: San Francisco, Cape Town, South of France, Kefalonia. My tip: Try and find out as much about your destination before actually arriving there. This will save precious time on your first couple of days and will avoid potential restaurant/activity opportunities being missed. I had a great holiday in Rome, where like any other tourist, I visited the Vatican City and the Sistine Chapel. They did not disappoint. I thoroughly recommend taking this cultural city-break. My first time skiing was in Lech at the end of the season, the weather was stunning, and I can honestly report it was one of my favourite holidays. I had two days of group lessons, which was far better than learning alone and something I’d opt for again in future. Learning to ski as an adult is exhausting and you need that motivation from your group! It’s also the best ice-breaker. Favourite resorts: Rome, Menorca and Lech. Favourite properties: Villa Nocetta, Cugó Gran and Severin*s.
Favourite lunch and après: Lunch at Aurelio Clubhouse and an après-ski dip in the pool at Severin*s.
I hold a pretty important role within the company and that is ensuring the other canines here tow the line; as the boss's dog I feel this is my duty. Outside of that, I pretty much just sleep. Favourite spot: My bed, obviously. Favourite time of day: Breakfast time and five minutes of madness running around in circles. Party trick: Not sure I have one....unless looking darn cute is a trick! I am always happy, life is so good! I seem to attract a lot of attention too – maybe it’s my extra long lashes? I have been at Oxford Travel Collection since I was nine weeks old, but they still won’t let me answer that thing that rings all the time. Favourite spot: Bed, but only if Sergei the meerkat comes with me. Favourite time of day: Greeting everyone in the mornings. Party trick: Giving high fives!  Oxford Private Travel makes it personal. We’re a small, passionate and well-travelled team who understand the importance of getting to know you. We work with the best teams on the ground globally to provide the most incredible travel experiences, and understand the importance of getting the little, as well as the big, things right. Furthermore, our contacts enable us to offer many VIP upgrades and perks. We’re dedicated to creating your dream holiday, and our complimentary pre-arrival concierge is there to support you in ensuring you make the most of your trip. Wherever and however you’re looking to travel in the world – beach or bush, city or wilderness, active or R&R - give Oxford Private Travel a call.